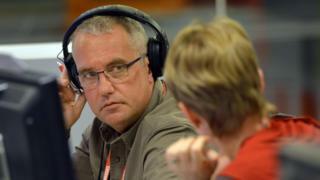 Presenter Eddie Mair is joining LBC to present a new show on the commercial radio station. The 52-year-old announced on Sunday that he was leaving the BBC after more than 30 years. Mair, who has presented Radio 4's PM programme since 1998, will host his last show on 17 August. He said LBC's "growth has been driven by bosses and staff who are passionate about radio, which is why I am eager to get started." "LBC has established itself as a ground-breaking broadcaster. Innovative, informed and fun with appointment-to-listen shows and a reputation for setting the agenda." James Rea, managing editor of LBC, added: "Eddie is a hugely respected broadcaster and I'm absolutely delighted he's joining LBC. "He will be a fantastic addition to our formidable line-up. I know Eddie's new show will be exceptional when it launches in September." LBC presenter James O'Brien described Mair's move as "a coup". Mair's successor will be announced in "due course", a BBC statement said. Mair tweeted his thanks for "all the kind words" from fans, and had hinted he would appear elsewhere as he was "changing jobs". Fran Unsworth, director of BBC News, said: "Eddie has delivered outstanding journalism and created a real bond with the audience through his mixture of warmth, incisive questioning and knowing when to listen in order to get the very best out of his guests. "He is one of the outstanding broadcasters of his generation and his new employer is very lucky to have him." Mair joined PM as a regular co-presenter in 1998 before becoming the sole host in 2003. He has also presented Newsnight on BBC Two and helped to launch Radio 5 live. He said: "I'm truly grateful to the BBC for being given more opportunities over the years than I deserved. "My apologies to PM listeners for all the things I've said that I shouldn't have, and all the things I should have said that I didn't. "Whoever comes next will be getting the best job in the BBC and I honestly wish them the very best." Gwyneth Williams, controller of Radio 4, said he was "a consummate broadcaster". She said: "You want to be in his hands when news breaks and I remember too, with respect, but also personal sadness, his conversations with Steve Hewlett during Steve's illness." Hewlett, presenter of the Media Show, shared his experience of coping with cancer in a series of interviews with Mair, who announced his Radio 4's colleague's death on his show last year. Jeremy Vine also announced that he was leaving Points of View after presenting the programme for 10 years. It comes after he was announced as the successor to Matthew Wright to front "The Wright Stuff" on Channel 5, which will be rebranded. Vine will continue his weekday BBC Radio 2 show. The presenter thanked viewers for their comments, "good and bad". Vine added: "It's given me such a privileged position to look at everything the BBC does on TV - watching it all from your point of view."